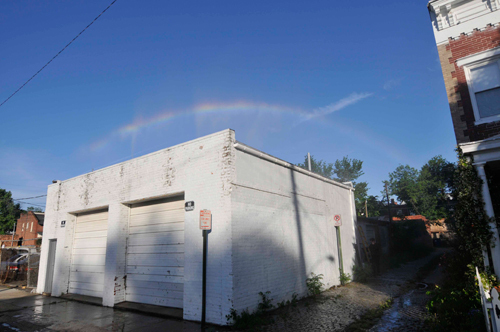 The Bemis Center for Contemporary Arts is pleased to present Michael Jones McKean’s The Rainbow: Certain Principles of Light and Shapes Between Forms. 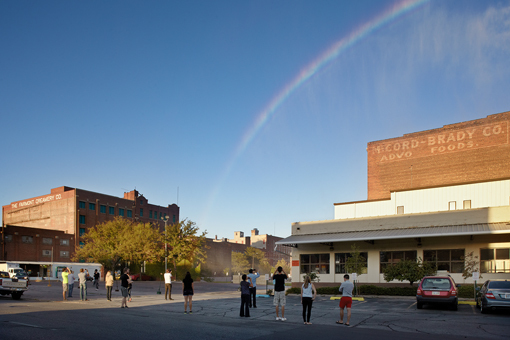 The project creates a simple, but phenomenal visual event — a rainbow in the sky. 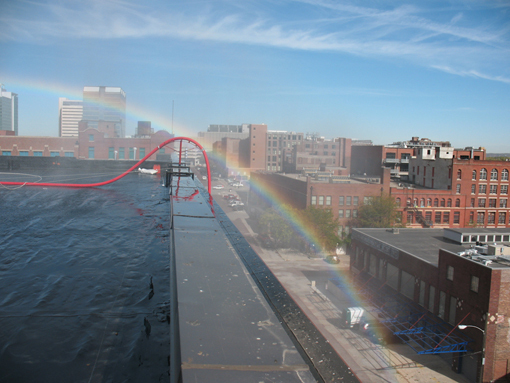 The public artwork will produce temporary rainbows above the Bemis Center for Contemporary Arts in Omaha, Nebraska using the most elemental materials: sunlight and rainwater. 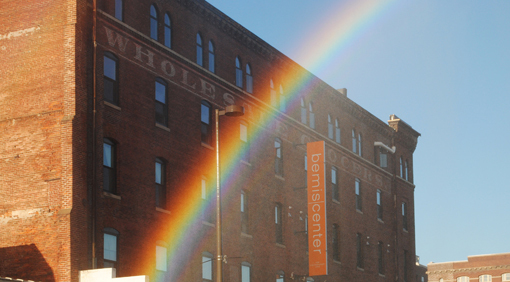 This summer, at scheduled times, a rainbow will appear above Bemis Center’s downtown building. This commissioned artwork and exhibition represents extensive cross-disciplinary collaboration. Irrigation and rainwater harvesting experts from Omaha-based Lindsay Corporation and Watertronics, structural and mechanical engineers, atmospheric scientists, plumbing and electrical experts and Bemis Center staff have joined artist Michael Jones McKean in creating a wholly integrated system for this site-specific, temporary work. McKean is a former artist-in-residence of the Bemis Center and current professor at Virginia Commonwealth University. Since 2002, he has conducted ongoing experiments leading to the production of this work. 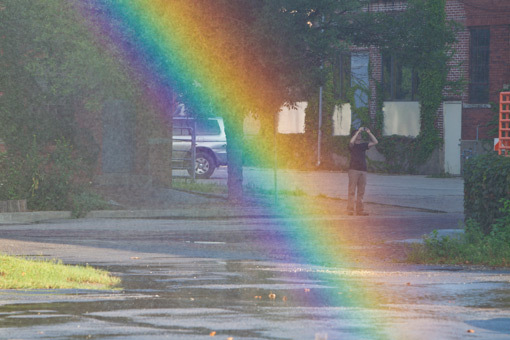 McKean’s work will amplify the placeless, celebratory, seductive and elusive qualities of the spectacular event of a rainbow. 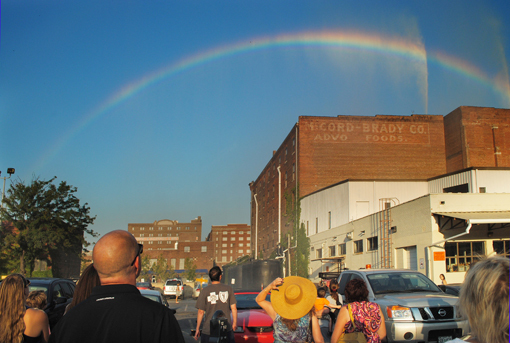 The artwork will solely utilize captured rainwater and will be powered with renewable sources. 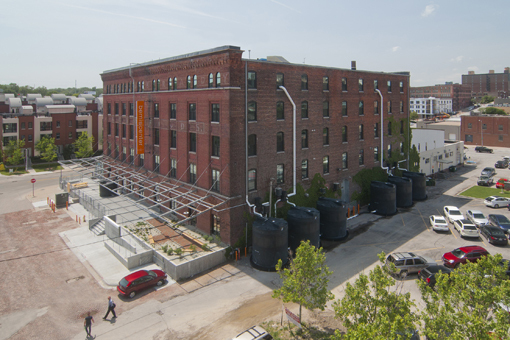 Leading up to the exhibition, extensive modifications to the Bemis Center’s five-story, repurposed industrial warehouse took place — creating a completely self-contained water harvesting and large-scale storage system. 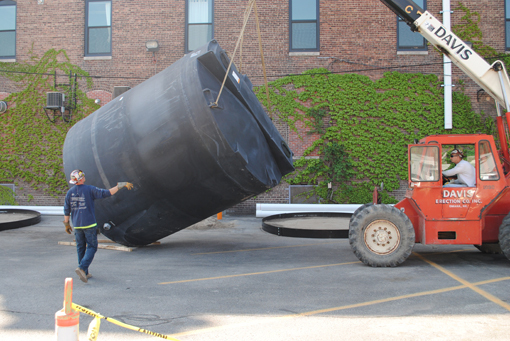 Throughout the project cycle, collected and recaptured stormwater will be filtered and stored in six above-ground, 10,500 gallon water tanks. 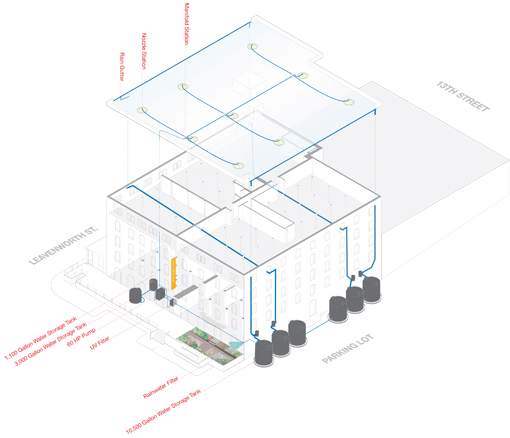 Within the gallery, a custom designed 60-horsepower pump supplies pressurized water to nine nozzles mounted to the 20,000 square foot roof of the Bemis Center. 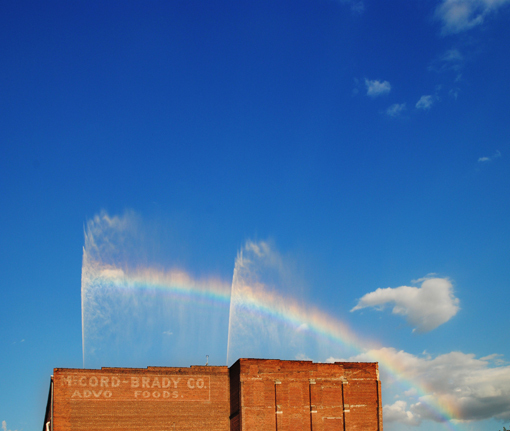 At timed intervals, in the morning and early evening, a dense water-wall will be projected above the building in which a rainbow will emerge. Based on atmospheric conditions, vantage point, available sunlight and the changing angle of the sun in the sky, each rainbow will have a singular character and quality. Depending on the position of the sun, one could see the rainbow from a thousand feet away or seemingly touch it with your hand. 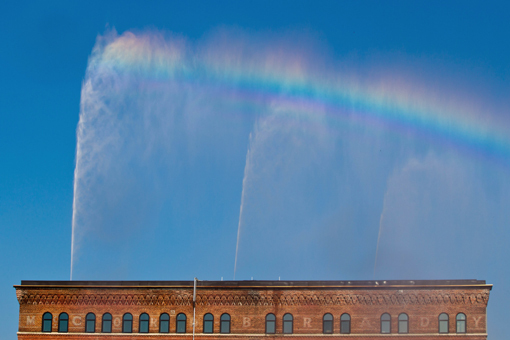 Whether a majestic arch in the sky that appears after a short spring shower or a small, homespun rainbow created with a garden hose on a sunny day, a rainbow operates as an egalitarian visual experience. It is by nature temporary, undetermined, and wonderful. 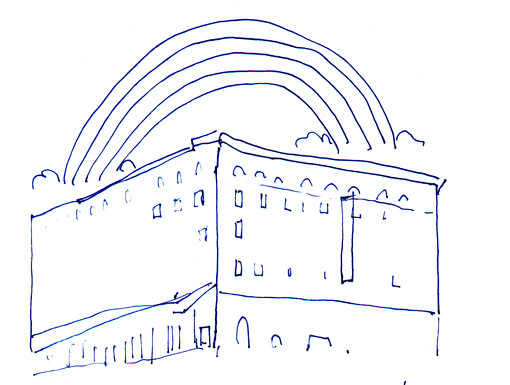 The Rainbow exists somewhere between real and representation, actual and artifice. 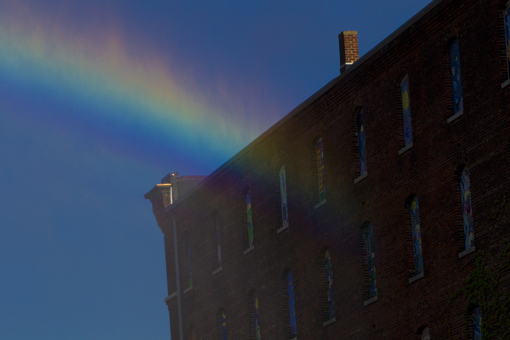 McKean is deeply interested in the rainbow as a complex form — ephemeral and steeped in mythology — that possesses an out-of-time existence as pure optical phenomena. The image of a rainbow extends through time, surpassing our known and archived histories, and operates as a constant unchanged form. Although the symbol of a rainbow has been co-opted, politicized, branded and commodified, an actual prismatic rainbow still has an ability to jolt us from the everyday. It feels hopeful, yearning, optimistic, ghost-like and meaningful. Whether perceived immediately as an artwork or not, the experience holds the power to connect diverse publics through an intangible, shared encounter. 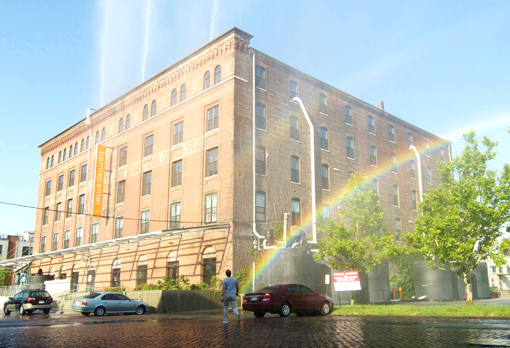 The Rainbow: Certain Principles of Light and Shapes Between Forms is McKean’s largest project to date. McKean’s work connects seemingly disparate cultural histories to specific form. He constructs spaces of uncanny scale — failed epics, specific objects that serve as synecdoche for expansive narratives, or condensed moments of universal phenomena. He is known for operatic, epic sculptural installations and delicate tableaus alike. In both, he builds dense narrative spaces composed of real and represented cultural talismans that stretch to encompass the fullness of meaning and human sentiment. 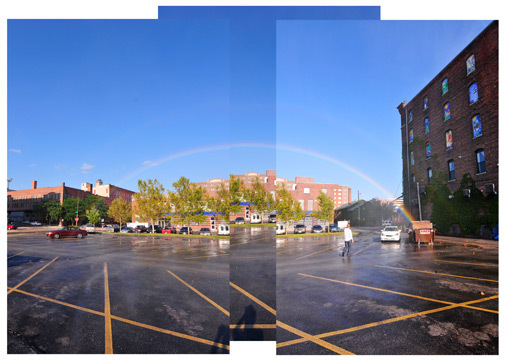 The Rainbow is a work of significant logistical complexity that realizes a silent, delicate and temporary visual experience. The work provides a direct and momentous experience of art, science, ecology and wonder. A series of weekly tours and dialogues about the project will be free and open to the public. Additionally the concepts of the work will be explored in a series of focused panel discussions and events planned in conjunction with the project. The Bemis Center will publish an exhibition and project catalogue, including essays that further illuminate these ideas. The exhibition catalogue, along with a project website, are designed by Project Projects. An iPhone and Android mobile app has been developed for the project by Mobile Roadie. The Rainbow: Certain Principles of Light and Shapes Between Forms is curated by Hesse McGraw, Bemis Center chief curator. Michael Jones McKean (Truk Island, Micronesia, 1976) is an internationally recognized American artist. He is the recipient of numerous awards, most recently a Guggenheim Fellowship, the Nancy Graves Foundation Award and an Artadia Award. McKean has been in residence at The Core Program at the Museum of Fine Arts, Houston, Texas; The International Studio and Curatorial Program, New York City; The Provincetown Fine Arts Work Center; the Bemis Center; The Archie Bray Foundation, Helena, Montana; and ThreeWalls, Chicago, Illinois. McKean’s work has been shown extensively nationally and internationally including recent exhibitions at Parisian Laundry, Montreal, Canada; the Quebec City Biennial, Quebec, Canada; Grand Arts, Kansas City, Missouri; DiverseWorks, Houston, Texas; Horton Gallery, New York, New York; Project Gentili, Prato, Italy; Gentili Apri, Berlin, Germany; Shenkar University, Tel Aviv, Israel; The Museum of Fine Arts, Houston, Texas; and Three Walls, Chicago, Illinois. has taught in the Sculpture and Extended Media Department since 2006. 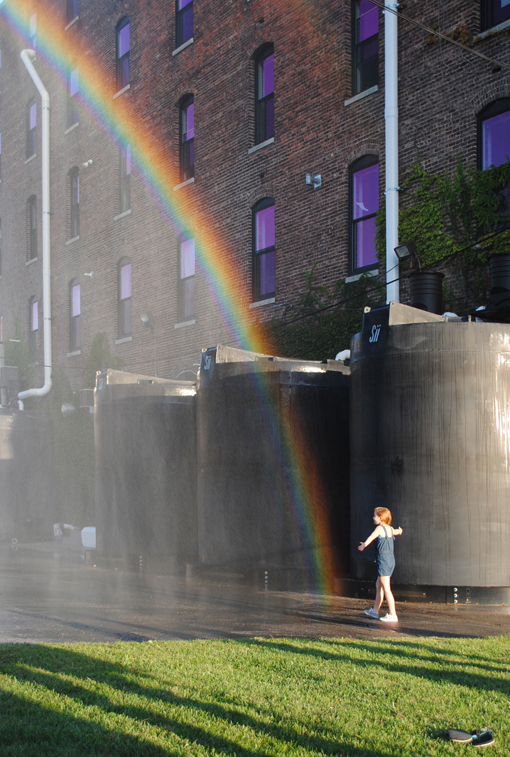 Beginning in 2002, McKean began a series of rainbow experiments, initially using off the shelf equipment and gradually increasing scale to commercial irrigation equipment. Intensive research on the logistics of presenting the project at the Bemis Center began in 2008, leading to a 1/6-scale test in Richmond, Virginia in 2009 and a partial scale test at the Bemis Center in August of 2010. The project was tested at full scale in October 2011 in partnership with Lindsay Corporation. The project’s public launch will commence in early June 2012, once the storage tanks have filled. 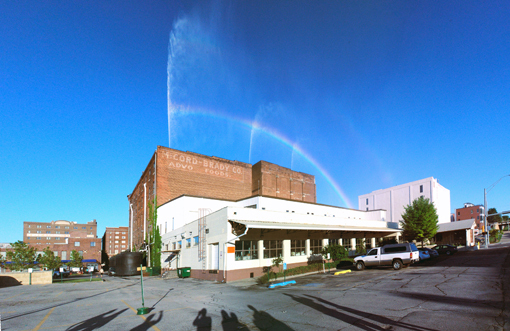 Engineering, rainwater harvesting and lead sponsorship of The Rainbow is provided by Omaha-based Lindsay Corporation, an irrigation and water management system provider and Lindsay’s subsidiary, Watertronics, which manufacturers SkyHarvester water harvesting systems. Additional major engineering and planning support has been provided by Rybin Plumbing & Heating, Snyder Industries, Inc., Professor Joseph A. Zehnder, Davis Erection and Crane Rental & Rigging, Education Power | Robert Webber, North Sea Films, Inc., Mobile Roadie, and Tyler Austin. For further information or print resolution images contact Andrew Hershey at andrew@bemiscenter.org or 402.341.7130 x 14. The Bemis Center would like to acknowledge the extensive efforts of its board of directors, staff and interns in realizing this project. The organization would particularly like to thank Todd Simon, vice-president and fundraising chair; Alex Priest, exhibitions assistant; Logan Seacrest, communications and events manager; Andrew Hershey, media director; Christina Vogel, development manager; Matt Lowe, chief preparator; Kenny Adkins and Brad Crabtree, facilities; and Mark Masuoka, our executive director.